Madeline Chaffee was at Pearl Harbor, Hawaii, when it was attacked by Japanese forces on December 7, 1941. She’s shown here, saluting during a Veterans Day ceremony in Lyndonville in November 2015. Today – December 7 – the world remembers the 75th year since the bombing of Pearl Harbor. There are many people in the Northeast Kingdom who still remember that day, but very few people who actually witnessed the nightmare. Madeline Chaffee of East Ryegate was at Pearl Harbor on that horrible day. The following article about Ms. Chaffee, which was written by Amy Ash Nixon, appeared earlier this year in our monthly magazine, Vermont’s Northland Journal. Madeline Batten Chaffee was a 21-year-old Navy parachute rigger based at Pearl Harbor, on the island of Oahu, Hawaii, and had barely arrived there for her service with the United States Navy when on December 7, 1941, the Pacific Island’s peace was shattered. Last year marked the somber 74th anniversary of that fateful day. It’s hard for Chaffee, who turned 96 on January 4, to reach into what she remembers. You don’t forget, she said, leaning forward and speaking with her eyes the words she cannot bear to summon, but it changes you, you don’t come home the same. In a way, she never left. After the war, Chaffee volunteered for the Civil Air Patrol, and she and her late husband, Jack, served on search and rescue missions—first in Massachusetts where they lived for many years then after they moved to Vermont in the 1970s, based out of the Caledonia County Airport on Pudding Hill Road in Lyndon. Born Madeline Chase on January 4, 1920 in Watertown, Massachusetts, she was a young woman ahead of her time who, she says, “grew up on the street with a bunch of boys.” She was a high school athlete, playing field hockey, softball, and basketball. After high school, she attended Boston University and went on to become a high school science teacher. 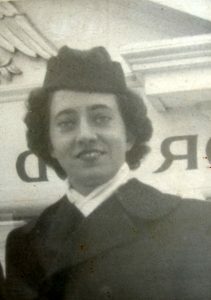 She was working in a private school teaching anatomy and biology when the war broke out but the United States hadn’t yet been dragged into it, and she felt a call to serve in the military. Her parents were not happy to see their only child, a daughter, no less, enlist in the Second World War. Chaffee during her war years. She went to boot camp and then when the military learned of her teaching degree, they sent her for further training so she could oversee a group of women at the base in Pearl Harbor, she said. She was trained at Hunter College then received additional training in the Great Lakes region of New York before deploying to Hawaii. “Fifteen of us were sent over to Pearl Harbor to see if we could take overseas training,” said Chaffee of herself and the women she oversaw. She said the women were treated with a great deal of respect by their fellow enlisted men, “They just treated us like part of the team,” she said. She said when her ship, Old Enterprise, made its way to Pearl Harbor, many people got seasick, but her family roots were fishermen from Nantucket Island off Massachusetts, and she had some seafaring in her blood and did not get seasick. She was called out to help operate the radio as a result. Pearl Harbor was remote and rustic, with thatch roof small huts and no real buildings the way it is today, she said. When they arrived on the island, they were presented with beautiful leis in traditional Hawaiian style. The peace and lovely setting were soon destroyed by that fateful day, however. Just 24 hours after arriving, she said Pearl Harbor was bombed. The servicemen and women stationed there were eating breakfast on December 7, 1941, when the Japanese bombing of the island began shortly after 7 a.m. “We were having breakfast and all of a sudden, the sirens and everything went off,” recalled Chaffee of that morning. At first, the stunned people on the naval base thought it was training exercises, but when they ran out and saw the sky filled with planes—more than Chaffee had ever seen, before or since—and saw the horror of ships being hit, they realized that this was the enemy attacking. The carnage that resulted from three U.S. ships— the USS Arizona, the USS West Virginia, and the USS Tennessee—being struck over and over during the horrific two-hour attack that morning was in the thousands. On one ship alone, more than 1,100 service members of the 1,500 member crew on board perished on that horrifying morning that has been forever emblazoned in the hearts of Americans in the history of the major moments of World War II’s deepest losses.“We stood there and watched it,” said Chaffee in a recent interview in Wells River, Vermont, not far from where she has made her home for the past half-century. She said she thinks her hearing was impacted from being at Pearl Harbor that day. It took years to rebuild the base. Chaffee said, “I was not the same girl when I came back [home] as when I went. I had had a very peaceful life” [before the war]. The war changes you, she said, in ways that she and many World War II survivors would rather not open up about. Chaffee’s role in the Navy as a parachute rigger was for the Navy’s air force. During World War II, there was not a separate Air Force as a branch of the military; every branch of the service had its own air force, she explained. “They’d look at me and say, yeah, yeah…” said Chaffee, smiling at the memory of the give and take from all those years ago when she was a young 2nd Class S Specialist in the Navy. What that meant, she said, was “they could throw me anywhere” she was needed. During her time stationed at Pearl Harbor, Chaffee also would go up on missions, searching for enemy submarines from the sky, and that, she said, planted in her the seed of wanting to come home and assist with search and rescues with the Civil Air Patrol. Her experience as a parachute rigger led to a lifelong passion for the skies, and Chaffee, on returning to the States would go on to fly with her husband, a pilot, and the couple owned their own plane. She later learned to fly when a good friend who was a patient flight instructor, suggested she should know how in case her husband needed her help one day on a mission. She is still a member of the Civil Air Patrol and has enjoyed more than 40 years of being part of the organization here, teaching young people about flying, and helping the community with searching for lost planes, missing hikers and more, she said. “I’d like to jump when I’m 100, like President Bush [wants to],” said Chaffee with a smile. Chaffee has been active in the veterans’ clubs in the Northeast Kingdom for many years, and she marches in parades and takes part in events on Memorial Day and Veterans Day. In Memorial Park in Lyndonville last Veterans Day, she stood with two other World War II veterans and was thanked for her service by Lt. Governor Phil Scott. Chaffee shook hands with about 100 local school children, which was deeply touching for her, she said. She was still at Pearl Harbor and watched from the sidelines as Japanese and U.S. dignitaries signed documents declaring the war was over. With the declaration came celebrating and a lot of horn beeping and cheering, that finally the war was over and they could go home, said Chaffee. “It’s difficult for me to think about it,” she said of what it’s like, looking back at what she survived, and remembering those who did not, at Pearl Harbor. 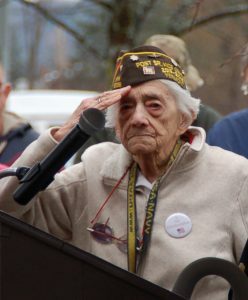 Even in the face of the devastation and the time after the horrifying December 7 attack, the men and women who were stationed at Pearl Harbor were steadfast, she said, determined to be unified, to be strong, and to not let their nation or their mission down. “They were together and no one was going to do anything to us,” she said of the fortitude and determination and strength they possessed. “Those young guys were afraid of nothing,” she said.